(Newser) – The company that owns an apartment complex where a bedbug infestation left a 3-year-old boy scarred has been ordered to pay his family almost $1.6 million. Mother Lilliana Martinez says that in 2012, two years after the family moved into the complex in Inglewood, Calif., they found son Jorge Maravilla had red spots all over his face and body, the New York Times reports. "Just seeing how he would scratch all the time and nothing would heal because it would start bleeding again," she tells NBC Los Angeles. "It was very emotional, very stressful." When a doctor diagnosed bedbug bites and they complained to the management company, they were told to throw out all their furniture. They vacuumed a small place to sleep on the floor after a fumigation left the apartment covered in white powder. No, Patchy, they'll probably sleep less agonizing over the fact that their lawyer got most of the award, leaving them a pittance. If she knew there was an ongoing health risk and chose to stay there with the children anyway, isn't SHE the one most at fault? 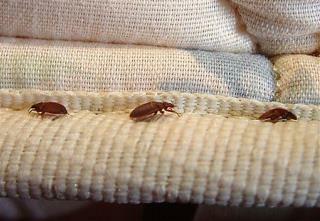 Bed bugs are evil incarnate. We had a huge bed bug infestation in a summer sublet in college....should have sued instead of just getting the F out without any of our furniture. At the same time, it seems that the apartment owners did try to get rid of the bed bugs, which are pretty much impossible to get rid of immediately without DDT. Current methods disrupt their reproduction cycle but dont really kill them - so it takes a while for the infestation to go away.